Tom Griffith is responsible for the profitability of Quanticate sites globally and has operational responsibility for the Quanticate site in India. In addition, Tom has responsibility for the roll out of the Corporate Strategy across the group, including the Balance Scorecard initiative. Tom joined Quanticate (OPS) in 2005. 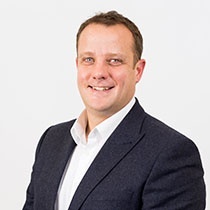 Prior to joining Quanticate, Tom was Corporate Communications Manager for MontionPoster plc, an AIM listed advertising company, before becoming General Manager of a national B2B services company.